Do you have a feature in Cycles that is left aside with the fear of adding some extra time to your renders? I do know some artists that “fear” using AO because it might “cost” you precious render time. But, some examples of architectural renders made in Cycles shows the opposite. And we can learn a lot from some projects, especially of you have a feature like AO that is always turned off. Here is an excellent example of not only an impressive artwork made with Cycles but also a great source of information. 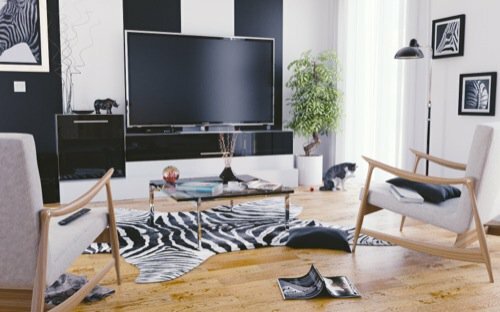 The project is named “Zebra living room” and by looking at the image, you will probably figure out the reason. But, why is this a good source of information? The author of the project is named grabeunwik and besides the images, we get some interesting information about the Cycles settings. You will notice that the image doesn't have noise. To get a noiseless render in Cycles would probably require an incredible amount of samples, right? According to the artist, all scenes used only 2000 samples. What is the secret? You can check that out yourself because grabeunwik shares all settings from the scene, at least the ones from Cycles. You get to look at the Sampling, Color Managment, and World settings. You can notice that the scene has AO enabled, and that might be one of the reasons we find it so attractive. Unfortunately, no information about render times is available, and we can't predict the impact of the effect on the project. A lot of artists doesn't use AO, or try to avoid it because it can increase a lot the time required to get an image done. Of course, you can't just go copying the settings to your scene and expect to get the same results. But, it might be an indicator that you should indeed experiment with AO before ignore it completely. It might just worth the extra time.